Blackmagic Web Presenter makes any SDI or HDMI video source appear as a USB webcam for higher quality web streaming using software such as Skype or streaming platforms such as YouTube Live, Facebook Live, Twitch.tv, Periscope and more! 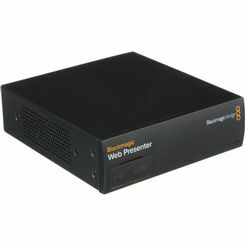 Blackmagic Web Presenter includes 12G-SDI and HDMI inputs, an XLR microphone input, HiFi audio input, and Teranex quality down conversion for converting any SD, HD or Ultra HD video source to 720p for easy, low data rate, high quality streaming. Plus, Blackmagic Web . . . .